Aberdeen manager Mark McGhee says players must adapt to his methods or leave the Scottish Premier League club. 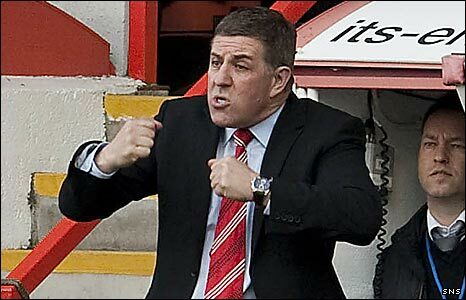 McGhee, smarting from the manner of two defeats in a row, admits that he is willing to adjust the way he works. "But what I'm not prepared to do is compromise what I believe to be the right way to do things," he said. "So, if there's going to be any change at Aberdeen in the long run, it's going to be the players who are going to have to change or leave." McGhee had criticised his players after last week's surprise Scottish Cup defeat at home to First Division side Raith Rovers. But, after Saturday's league loss away to Falkirk, he said he had a frank exchange of views with his players in the dressing-room. "I'm prepared to do anything that gets us more consistent results," the manager told BBC Scotland on Thursday. "If that includes making certain adjustments to the way I work or what I do with them or when they get a day off or don't get a day off then of course I'm prepared to do that." However, McGhee insisted that it was the players who had to make the bigger adjustment. "They're either going to change to work the way I work or they're going to leave the football club and we'll find new players to come in and do it the way I want it done," he said. Jamie Langfield will return to the Aberdeen side against Hearts on Saturday after missing the defeat by Falkirk through illness, but McGhee is also looking for the goalkeeper to improve his game. "Langfield was always going to play," he said. "Him and I have had a discussion and we understand where we're coming from. "I have no problems with him. He just has to play the way he can play - play the way that got him into the Scotland team. "I've said to him that, although he was making fantastic saves, there are other areas of his game. "I think he needs to be more confident more determined and more aggressive. He knows how I feel about that and I'm sure he'll be like that on Saturday."